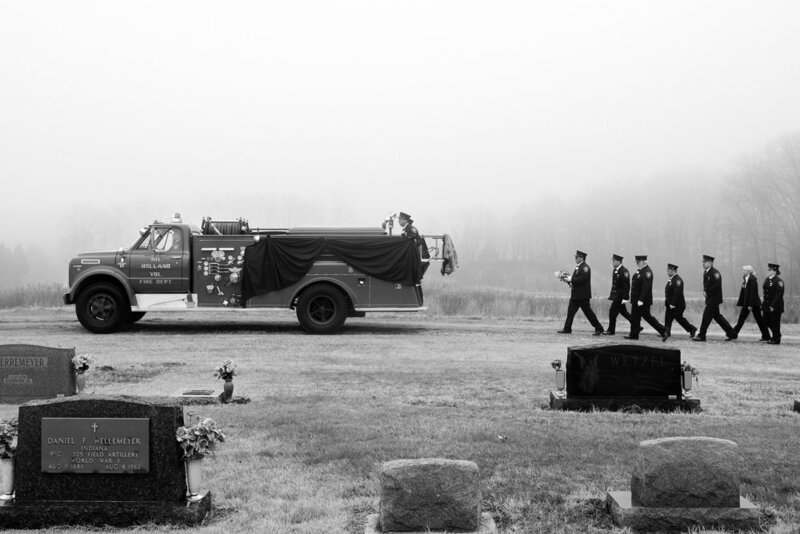 Members of the Holland Volunteer Fire Department walked behind a 1968 Chevrolet fire truck as it carried the casket of Doug Partenheimer, 54, of Holland, through the Holland United Methodist Church Cemetery. Partenheimer was a member of the town's fire department for 35 years, during which time he served as assistant fire chief and was most recently the acting treasurer. The old pumper was purchased new by the department in 1968 and is kept around to be used in parades. Holland Fire Chief Greg Englert said it was the first time to be used in a burial procession for a member of the department. Jasper’s Dane Giesler lumped to the ground after being thrown out at home plate for the final out of the Class 3A sectional championship at Ruxer Field in Jasper. That was the cue to celebrate for Heritage Hills, which hung on to win 4-3 and claim its first sectional title since 1997. 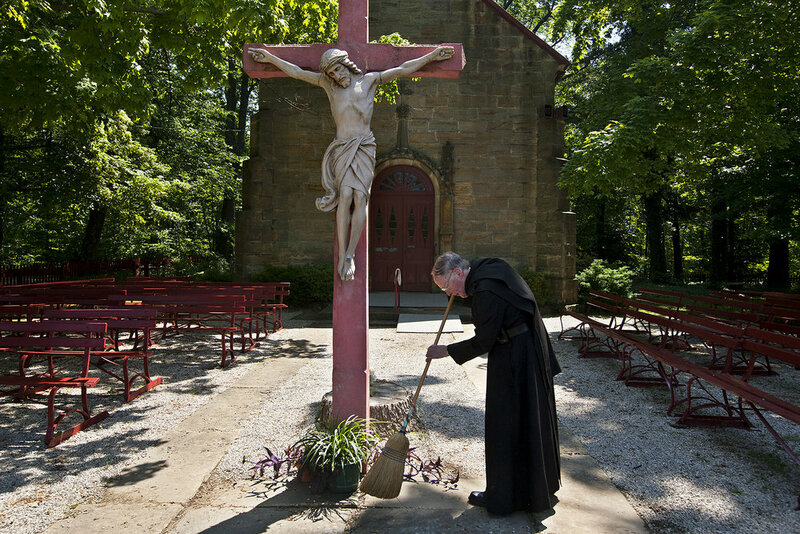 For the last 20 years, Brother Terence Griffin, 80, has spent many Sunday mornings in May and October preparing the Monte Cassino Shrine in St. Meinrad for pilgrimages that honor the Blessed Mother. Bro. Terence swept the rocks off the walking path in front of the shrine before the public arrived. Each of the monks of St. Meinrad Archabbey is given work assignments by the abbot based on the jobs that need to be done and the monks’ personal strengths. These duties provide the monks with an opportunity to serve God, the community and each other. Andrew Franklin, left, and Quentin Lechner, both 11, shot hoops and played Around the World after school at Gutzweiler Park near their Jasper homes. The two said they weren't bothered by the snow or the cold. "Since we are moving around, we are staying warm," Andrew said. "Yeah, kinetic energy," Quentin added. First Lt. Leticia Holloway, right, situated a medal on her brother, Cpl. Dyron Norris, as they prepared for the Army Junior ROTC annual military ball. Tyler Lampert, left, and Logan Ingle, both of Dubois, and Logan Borden of Jasper sat near the gravesite of their high school friend, fallen Marine Lance Cpl. Alec Terwiske of Dubois, in St. Celestine Cemetery in Celestine. The three men said they and other friends will gather from time to time at Terwiske's gravesite, sit in lawn chairs and just spend time visiting their friend. Ray LaFlamme, 88, says music saved his life. The Jasper resident was drafted into the U.S. Navy after graduating from high school in 1943. After boot camp, all but he and one other person in his company were assigned to the USS Bunker Hill. “They heard I could play a pretty good trumpet,” he said. LaFlamme was sent to the U.S. Navy School of Music in Washington, D.C. The aircraft carrier was later attacked, killing many men from LaFlamme’s company. 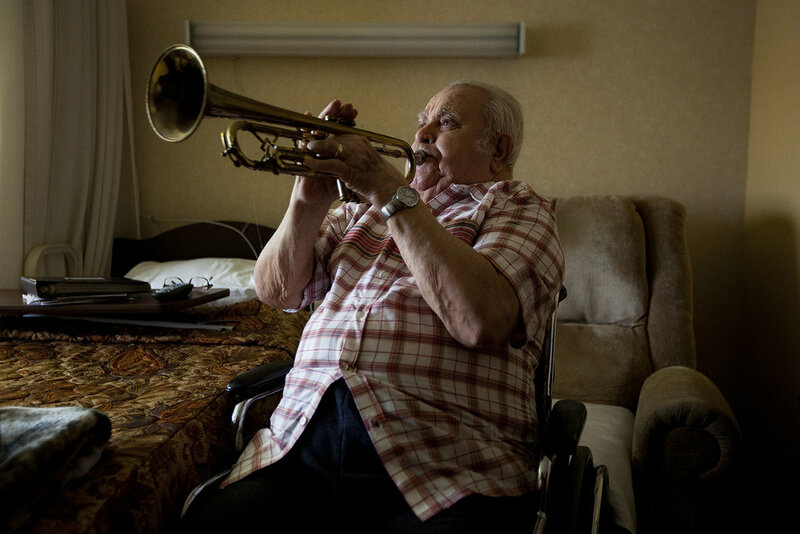 LaFlamme still plays his horn as he did in his room at St. Charles Health Campus in Jasper. Northeast Dubois' Kaylan Jacob, right, lent a hand to Natasha Schepers as they nervously watched the Jeeps last attempt to mount a comeback against Springs Valley in the bottom of the seventh inning of the Class 1A softball sectional championship in French Lick. 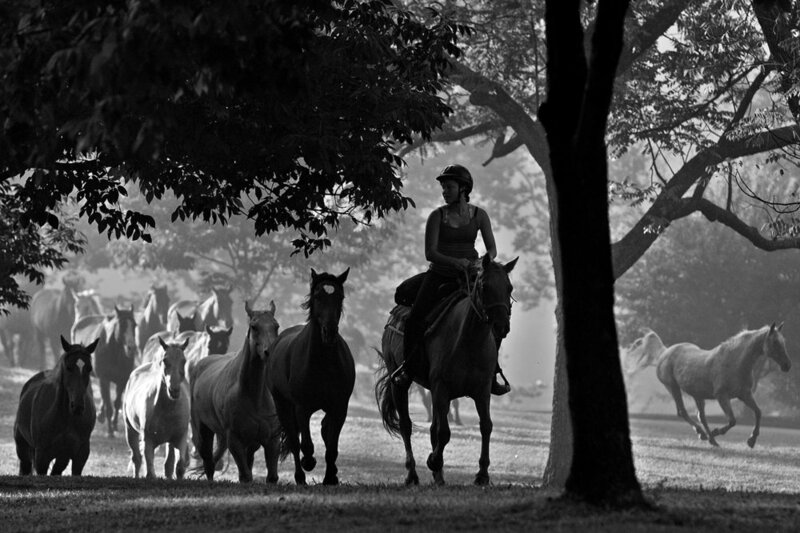 Before the campers at Camp Carson in Princeton woke in the morning, Leah Miller of Jasper stampeded the 16 horses from the pasture up through camp to the barn to begin getting them ready for the day. 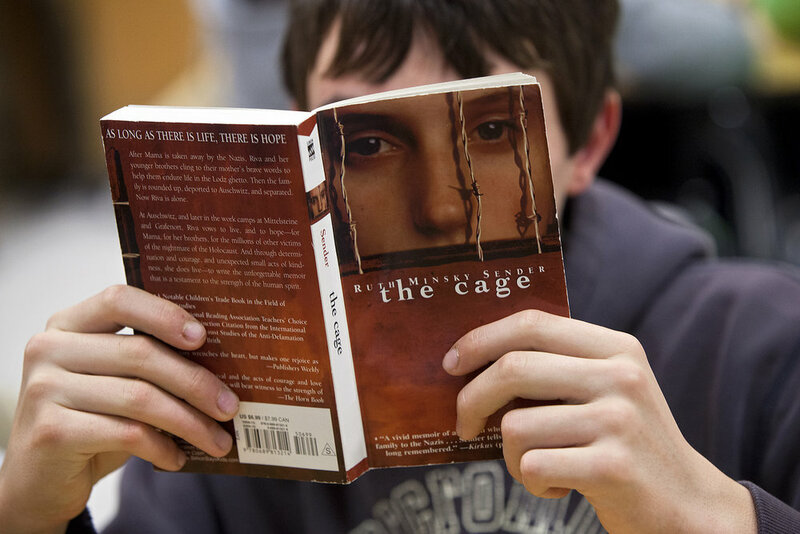 Holy Family seventh-grader Adam Krempp joined a small group of his classmates in reading the book "The Cage" by author Ruth Minsky Sender during class. Alison Lindauer's class spent the class period beginning to read different books about the topic of the Holocaust in small groups. Each group will create a "resource box" that is decorated in accordance to the book they read and the box will be filled with items related to the book as well. Prestyn Balsmeyer of Huntingburg, 14, right, and his brother Chanler, 11, pulled with all their strength during the tug of war competition during the Dubois County 4-H Fair. Lance Cpl. Ben Knies, left, and Lance Cpl. Nathan Schroering, both high school friends of Lance Cpl. 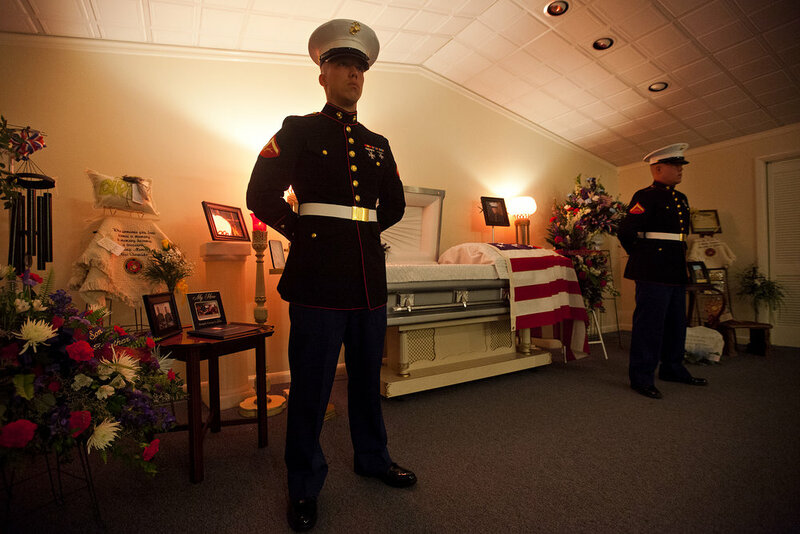 Alec Terwiske, were the first two Marine sentries posed in front of Terwiske's casket at the Becher-Kluesner North Chapel funeral home the evening Terwiske's body was first returned to the county. A different sentry was posted each hour overnight and two stood guard throughout the visitation. IHSAA rules for two-a-day practices prohibit the teams from running full contact drills on the first two days of practices. The Forest Park team ran through plays the morning of the second day of two-a-day practices. Jasper seniors Kirk Stenftenagel, left, Issac Lechner, Mark Giesler and Nate Messier spent halftime of the Class 4A sectional championship game against Evansville Reitz in a hunting blind at Jerry Brewer Alumni Stadium in Jasper. The Wildcats lost 31-30. A crossbred heifer named Storm nuzzled up against Elizabeth Brinkman of Huntingburg, 16, as she rested with her cattle at the Dubois County 4-H Fair. 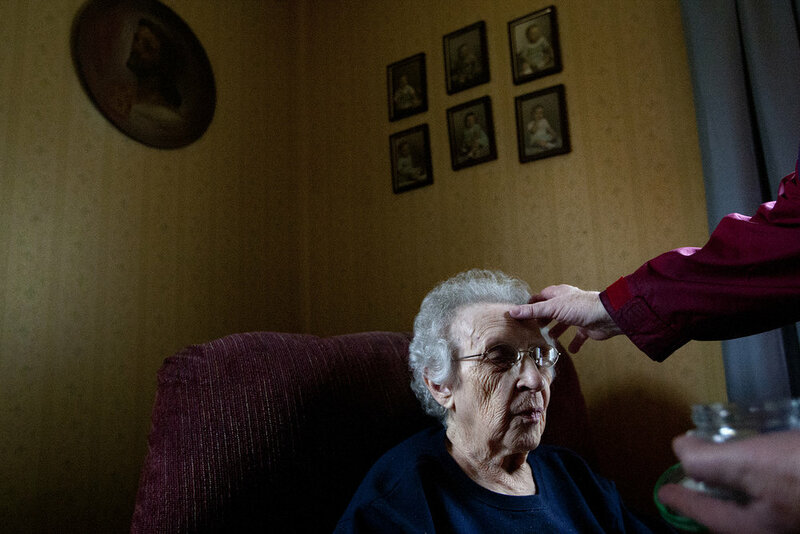 Irma Sermersheim received the sign of the cross marked by ashes on her forehead from Sister Mary Jane Kiesel in Sermersheim's Jasper living room. Sr. Mary Jane visited a handful of homebound individuals to pray with them and distribute Communion and ashes in celebration of Ash Wednesday. Ash Wednesday begins the Christian season of Lent, a period of preparation for Easter. Cuddling with her baby doll, The Waters of Huntingburg resident Marge Short swayed side-to-side to the music during a St. Patrick's Day celebration for residents in the Hope Springs wing of the Huntingburg facility. Hope Springs is a unit with specialized care for residents with Alzheimer's and dementia. Short, who has dementia, has three dolls she enjoys caring for on a daily basis. Two of the dolls are her granddaughter's former dolls from more than 20 years ago. Jasper High School junior Amy Stork pumped a fist as she lined up for the 400-meter relay during the unified track meet between Jasper and Boonville at Jerry Brewer Alumni Stadium in Jasper. 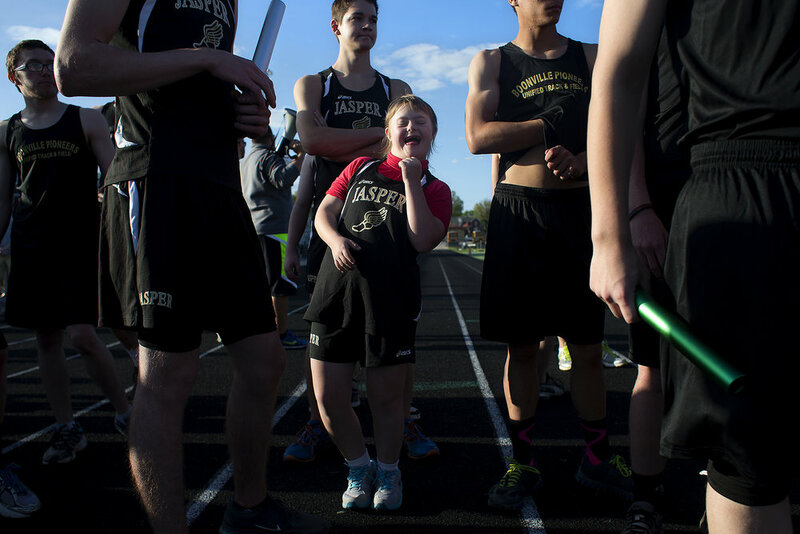 The meet was the first for the JHS unified track program, which allows special-needs students to participate in a sport and experience the social sector of athletics they may have otherwise missed as part of their typical school day. Providence Home Health Care Center cook Becky Partenheimer danced with resident Kenny Aders as they listened to the music of Louisville performer Jeff Rehmet as he played on his electric piano and sang songs Wednesday at the Jasper nursing home. The performance is part of an outreach series started this week by the Jasper Arts Center to take the arts to area nursing homes. Several members of the Forest Park varsity baseball team hopped and clicked their heals together as they ran in between innings during the Class 2A baseball sectional against Tell City at League Stadium in Huntingburg.